On 11 April, CNRI released the new Java version of the Handle System®, its software used for assigning, managing, and resolving persistent identifiers, known as "handles", for digital objects and other resources on the Internet. This version reflects a substantial redesign effort, incorporating important improvements in the administration of handles and handle services. All code written in Java for platform portability. Server performance greatly increased, with preliminary measurements indicating approximately 1K resolutions/second on fairly old hardware. Administration features built directly in the handle protocol, replacing a much less robust HTTP implementation. Public key authentication capabilities built into both client and server, enabling trusted resolution and distributed administration. Implementation limit on handle length removed; handles may now be any length. An improved and more usable client library, facilitating the creation of new specialized handle clients. During the brief transition of all handle services to the new Java handle system, resolution continued uninterrupted, and most changes were transparent to users of the system. Backwards compatibility was retained for resolution through the use of gateway services that remained in operation until all existing local handle servers converted to the new version. The release consists of the Local Handle System Server, Java version 5.0.0 beta (binary and source code); Handle System Client Library, Java version 5.0.0 beta (binary and source code); Client Library C version 5.0.0 beta (source code); and the Handle System Resolver Plug-In, version 2.0 beta (binary), and all software is available for Internet download without fee. For more information about the handle system, go to <http://www.handle.net>. Please direct inquires to Jane Euler, CNRI, at <jeuler@cnri.reston.va.us>. 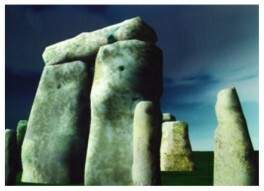 Image: Virtual Stonehenge, courtesy of R. Stone. There has always been strong interest in using technology for cultural heritage education, entertainment, conservation and preservation. Now, with the combination of virtual reality and cultural heritage, heritage visitors can be immersed directly into our world�s past, encouraging exploration, discovery and interaction without fear of damaging the real sites and antiquities. Yet, even though the virtual heritage industry has grown considerably over the last 10 years, it is still fragmented and difficult to find published research, other professionals, news and event information. For these reasons, The Virtual Heritage Network was launched in early 2000 to provide an international, common network point for solving these issues. In a few short months, VHN now has more than 240 international members from 44 countries, 22 Directors and 7 Partners. The Virtual Heritage Network [VHN] is a new international non-profit organisation designed to assist professionals in the utilisation of advanced technology for the education, interpretation, and preservation of cultural heritage. VHN offers services to the virtual heritage community through conferences, projects and information dissemination. At the core of VHN is the website <http://www.virtualheritage.net>, which hosts a substantial database of news, conferences, events, employment opportunities and an electronic library for the permanent archival of manuscripts, projects and websites relating to virtual heritage. One of the founding members, Prof. Ojika from Gifu University in Japan, says, "Cultural Heritage is extremely important as it tells about our sociological, cultural and natural past. Virtual Reality technologies are a great way to increase our understanding of this important part of human life...In this sense, we gain human wisdom by integrating the eternal values of our heritage and ever-progressing technology in perfect harmony. With VHN we want to provide a permanent archive for people to find out about virtual heritage, and give educators new methodologies to teach the 'Nintendo Generation' about very old cultural heritage through new role-playing styles of interactive education." In October 2000, the 3rd Special Session on Virtual Heritage will be held as a part of VSMM2000: the 6th International Conference on Virtual Systems and MultiMedia in Gifu, Japan, <http://www.vsmm.org/vsmm2000>. It will highlight some of the new most innovative and breathtaking work in the Virtual Heritage industry, including the latest imaging, data capture and modeling techniques, remote sensing and GIS systems, object restoration and modeling and more. The VH Session will also accommodate archaeologists, historians, policy makers and other professionals by presenting the latest in historical and accuracy issues, machines within a cultural heritage setting, interactive tourism and other important topics. While the virtual heritage industry is still in its infancy, initiatives like the Virtual Heritage Network provide a core focal point for advancing heritage and technology, through developing programs of information dissemination, access and knowledge databases. Through these and other efforts, a strong community of researchers, historians, computer programmers and other professionals are now developing sophisticated uses of virtual reality to interpret and preserve our ever-important cultural heritage. Membership to the Virtual Heritage Network and the use of its services is free. For information, please refer to: <http://www.virtualheritage.net>. In 1920, Sir Sidney F. Harmer, Director of the British Museum (Natural History), wrote to P. Chalmers Mitchell, Secretary of the Zoological Society of London, to ask that Mitchell apprise the Conjoint Board of Scientific Societies - an organization of the leading scientific societies of Great Britain and Ireland at the time - of a major "defect in the organization of science." Harmer had observed that while scientific research results were published in a "multitude" of journals and written in a wide range of languages, there was no centralized resource to assist scientists in identifying these publications or their availability. A year later, after discussion within the Conjoint Board and the appointment of a coordinating committee, a circular was sent to libraries and other institutions formally announcing and soliciting participation in a cooperative project to prepare a World List of Scientific Periodicals. The first volume of the first edition of World List of Scientific Periodicals was published in 1925 and contained a numbered list of the full titles of the periodicals identified by the project. A companion second volume, consisting of a listing of the abbreviated titles of these periodicals along with a location notation, was published in 1927. This volume included not only standardized forms of journal title abbreviations but a wide range of variations as well. Nearly seventy-five years later, in an effort to correct a �defect in decoding journal abbreviations�, a central registry of Web resources that list or provide access to the full titles of journal abbreviations in a wide range of disciplines has been established. Entitled All That JAS: Journal Abbreviation Sources, the site is compiled and maintained by Gerry McKiernan (gerrymck@iastate.edu), Science and Technology Librarian and Bibliographer, Iowa State University. To date several dozen Web resources have been identified, categorized, and incorporated within the registry. In addition to separate listings or access for abbreviated journal titles, selected OPACs that offer abbreviated title searching are also included. A few of the sites in All That JAS also provide access to the full title of other types of abbreviated publication titles (e.g., conference proceedings titles). Included within the registry are sites that provide a listing or access to journal abbreviations in a number of subjects (General), sites with coverage of a broad subject area (e.g., Biosciences), and sites that cover a specific discipline (e.g., Anthropology, Chemisty, Engineering). All types of Web domains are represented in All That JAS, with governmental and educational sites the more common. Among the notable general sites listed are the CISTI Online Catalog of the Canadian Institute for Scientific and Technical Information, ISI Journal Abbreviations used in citation indexes produced by the Institute for Scientific Information ® (ISI ®), and the List of Journal Abbreviations of the Swiss Federal Research Institute. Broad and specific sources in the registry include the List of Journals Indexed in AGRICOLA (National Agricultural Library), the List of Core Journals Covered in CAplus (Chemical Abstracts Service), and NLM/Medline Journal Abbreviations (National Library of Medicine). All That JAS: Journal Abbreviation Sources is accessible at <http://www.public.iastate.edu/~CYBERSTACKS/JAS.htm>. Nominations of other sources that provide access to the full title of journals or other publications for an abbreviation are welcome. As the world becomes increasingly wired and users clamor for immediate access to information, libraries have responded by offering more electronic resources and services to their patrons. One of the fastest growing services in libraries and other information industries is digital reference, or "AskA services" (as in "Ask-an-Expert"). These services are Internet-based question/answer and referral services that connect users with experts and subject specialists who can answer questions and give pointers to other sources of information. The Virtual Reference Desk (VRD) is a project dedicated to the advancement of digital reference, and the successful creation and operation of Internet-based information systems using human intermediaries as subject experts or guides. VRD is a project of the ERIC Clearinghouse on Information and Technology, with support from the White House Office of Science and Technology Policy. Dig_Ref discussion list, open to all organizations and individuals interested in digital reference issues and practices. To subscribe, e-mail <listserv@listserv.syr.edu> with the message "subscribe Dig_Ref <your first name> <your last name>". VRD Network, a collaborative network of digital reference services that answer questions from the K-12 community. Participants include AskERIC, Library of Congress, Internet Public Library, the Geological Society of America, and a host of other services. Volunteers to help answer questions are always welcome; please contact VRD for more information. VRD conference, in Seattle on October 16-17, 2000. Building on the success of last year's sold-out conference in Boston, this year's conference will explore the issues and challenges in providing quality digital reference in all contexts to an ever-growing population. For more information on the conference, see <http://vrd.org/conferences/VRD2000/index.html>. AskA+ Locator <http://www.vrd.org/locator/subject.html>, a searchable database of over 75 high-quality digital reference services that answer the questions of the K-12 community. VRD Consortium, a group of organizations interested in promoting Internet Q&A with human intermediaries. The group works towards establishing rules and criteria for a national cooperative digital reference effort, including standards of quality, software, and more. For more information on the Virtual Reference Desk, please e-mail the project at <vrd@vrd.org>. New York, NY - JSTOR's new General Science Collection, which will cover more than 800 journal years of scientific literature, has been attracting libraries at an astonishing rate since its initial release in February 2000. More than 220 libraries worldwide have signed agreements to participate in the Collection, which will offer a complete electronic archive of seven important scientific journals. The General Science Collection reaches back to the 17th century and will contain approximately 1.4 million pages of scientific journal literature. As an example of the depth of this collection, Sir Isaac Newton's earliest published papers are among the treasures of scholarly publishing that will be available over the Internet to colleges, universities and institutions participating in the General Science Collection. Researchers will also see the original engravings of van Leeuwenhoek's observations through the earliest microscopes. "The General Science Collection is an invaluable information resource for researchers, scientists, and historians of science, as well as a rich teaching and learning tool for faculty and students," says Kevin M. Guthrie, President of JSTOR. "With scholars and students increasingly dependent upon resources which are electronically available, JSTOR's mission to archive and preserve this material serves to reinvigorate this important collection of scholarly research. We are pleased that so many institutions are recognizing the significance of this journal collection, and the exciting opportunities that it presents to the academic community." Access to General Science titles has been eagerly anticipated at institutions that participate in JSTOR's Phase I Arts and Sciences Collection. In a survey conducted in September 1999, Librarians at those institutions told JSTOR that they would much prefer to have as much of this collection as possible available even as digitization of the full collection proceeded. Hence, the General Science Collection is being released in chronological segments beginning with more recently published issues. On February 16, 2000, JSTOR released the initial content of the General Science Collection, which covered the 1980's. At 323,744 journal pages, it was JSTOR's single largest content release to date. The 220 institutions participating in this new collection currently have full access to those pages. The costs of creating this collection have been high. JSTOR received support from The Howard Hughes Medical Institute, The Josiah Macy, Jr. Foundation, and the Andrew W. Mellon Foundation to help offset the significant costs of its creation. This support has allowed JSTOR to substantially reduce the one-time fees that institutions pay for participation in this Collection. JSTOR is an independent not-for-profit organization with a mission to create and maintain a trusted archive of important scholarly journals while at the same time improving and extending access to those journals by the entire scholarly community. It originated as a pilot project of The Andrew W. Mellon Foundation in 1994 seeking ways to help libraries meet the space and budgetary challenges posed by the growing volume of scholarly research, while at the same time providing enhanced access to older scholarly material. The General Science Collection initiates JSTOR's second phase, following upon the completion of the Arts and Sciences Collection in November 1999. That collection contains the complete backfiles of 117 journals in 15 academic disciplines in the humanities and social sciences, more than 5 million pages. During 1999, 4 million searches were performed, more than 3.2 million articles were viewed and over 1.3 million articles were printed from JSTOR. More than 680 libraries worldwide and more than 100 publishers participate in this cooperative effort. For library participation information please contact Carol MacAdam, Associate Director for Library Relations via email: <clm@jstor.org> or by phone: 212-229-3700. Report on the "Managing the Digital Future of Libraries" Conference Held in Moscow. During the third week in April of 2000, a two-day Conference was held in Moscow at the Russian State Library with a single day Pre-conference held at the State Public Historical Library. In total, nearly 300 people from more than a dozen nations attended the three-day event. The occasion for the Conference was the scheduled completion of a new On-line Public Access Catalog for the Russian State Library. The Pre-conference, entitled "Electronic Document Delivery in a Library Context" focused specifically on problems of electronic document delivery within the nations of the former Soviet Union. Major themes addressed at the Pre-conference were: the problems with electronic document delivery pricing structures within the context of the Russian economic situation, the importance of electronic document delivery for smaller Russian regional libraries, and particular technological and software problems faced by Russian libraries in implementing electronic document delivery services. The two-day main Conference concerned broader topics such as the evolution of libraries, and library programs and services to meet the needs of an increasingly computer oriented digital culture, not only in the Russian context but worldwide. The topic of Plenary Session was National level Digital Library initiatives in the Russian context and cooperative ventures such as between the European Union Tacis Project and the Russian State Library. Session I was concerned with general aspects of networked library information resources and specific Integrated On-line Library Management systems such as that which was adopted by the Russian State Library. Session II was concerned with specific projects using digitization as a preservation strategy for library materials and problems of maintaining digital materials over the long term. Session III focused on the problems and challenges associated with the retrospective conversion of Russian card catalogs. Session IV was concerned mainly with general overviews of metadata schemes and standards of text mark-up, particularly the Dublin Core and XML and their role in future Digital Library projects. Sessions V and VI were both devoted to specific examples of Digital Library Projects in Russia and other nations of the former Soviet Union such as Armenia and Azerbaijan as well as Western European and American projects such as the Scottish "Scran" project and the American JSTOR project. A CD-ROM was produced containing the texts of those papers that were submitted to the organizing committee in advance of the Conference. A second edition of the CD-ROM is planned which will contain Russian and English versions of all the papers presented during the Conference. These CD-ROMs are planned to be available at both the �Crimea 2000� conference in June and the IFLA Conference in Israel in August. For more information, contact Monika Segbert at the Russian State Library: <monika@rsl.ru>, or see the Conference web-site at <http://www.rsl.ru/tacis/conf.htm>.